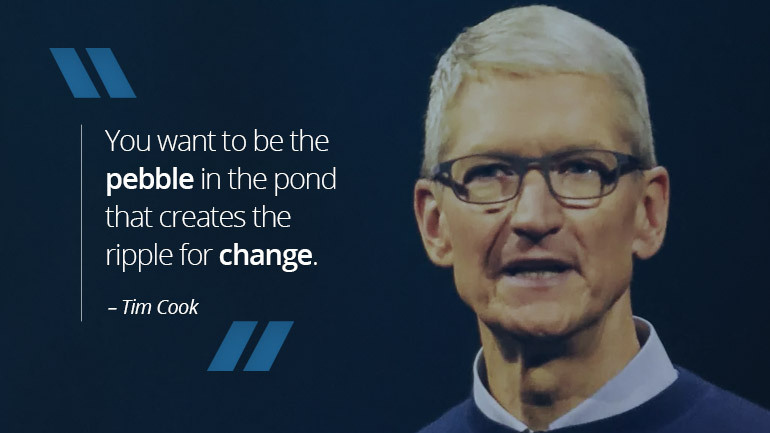 Tim Cook is the man behind Apple, the world’s largest company in market capitalisation and actually the first US-based firm to hit $1 trillion, a feat it achieved only in 2018. Tim was born in 1960 in Alabama. His upbringing was a modest one; his father was a shipyard worker whereas his mother worked at a pharmacy. He was always a bright mind in school, graduating in the second position in 1978 from the high school he attended, Robertsdale High School. This earned him an admission to Auburn University, where he graduated in 1982 with a bachelor’s degree in Industrial Engineering. Tim later pursued an MBA in Duke University, where he was awarded the prestigious Fuqua Scholar title, an honour only granted to students that graduate in the top 10 per cent at the business school. Prior to joining Apple, Tim had a 12-year stint at IBM where he rose through the ranks to become the company’s director of North American fulfilment. This was followed by a 3-year spell at Intelligent Electronics as the chief operations officer, and later a 6-month bout at Compaq as the corporation’s vice president of corporate materials. Then Apple Inc. came knocking on the door. In 1998, Tim joined Apple as senior vice president for worldwide operations, tasked with cleaning up the company’s manufacturing, distribution and supply system. Tim had built a reputation as an operations genius before this role and the Apple assignment was as tough as it could get. Back then, Apple was on its knees, burdened by a series of failed products, underperforming CEOs and consecutive quarter on quarter losses. The legendary Steve Jobs had come back to the company and was focused on creating wonderfully designed products with much-improved usability, but Apple’s biggest headache was its supply management apparatus. And he started his mop up from the get-go. A firm believer of ‘inventory is fundamentally evil’, Tim immediately sought to pull Apple out of manufacturing. Factories and warehouses were closed, to be replaced by innovative agreements with contract manufacturers. As a tough negotiator, Tim was able to grant Apple unprecedented control over the contractors’ manufacturing processes in exchange for juicy, long-term contracts. As a result, Apple inventory, determined by the time period it spent on the company’s balance sheet, drastically reduced from months to days. Tim also reduced key suppliers by 75% and forged tighter relationships with them to ensure they were completely aligned with Apple’s vision. A good example would be in 2005 when Apple was launching the iPod Nano. Tim paid over $1.25 billion to flash memory suppliers, a move that effectively bought out their 5 years’ worth of stock and staved off competitors. It was not the first time Tim had worked to frustrate competitors though; because immediately after he was hired in 1998, he bought $100 million worth of air freight in advance to ensure Apple’s new iMac products shipped on time. As Apple continued to release ground-breaking products, it was Tim’s operations magic that ensured the company became a money-spinning machine. Tim was named CEO of Apple in 2011 following the death of the founder and then chief, Steve Jobs. The company has maintained steady growth under his leadership and aside from being the first trillion-dollar US company, it boasted cash reserves of $243.7 billion and zero debt as of Q3 2018. In his own words, Tim said that he runs a company that is ‘entrepreneurial in its nature but with the mother of all balance sheets’. His operations smarts are no doubt a key contributor to all that.